If you have read my books, you know what a role food plays in each story. It bonds couples. Families. Friends. And I also include food scenes because I am not only a foodie, but an avid cook. I have a HUGE cookbook collection *embarrassed cough have not cooked out of all of them* and one of my biggests stupid excited moments is when I crack open a brand new cookbook to see what I can discover. Because of this, I thought a fun feature on the blog might be to pick a recipe, make it, and share the results with you. First up in this cook along feature? 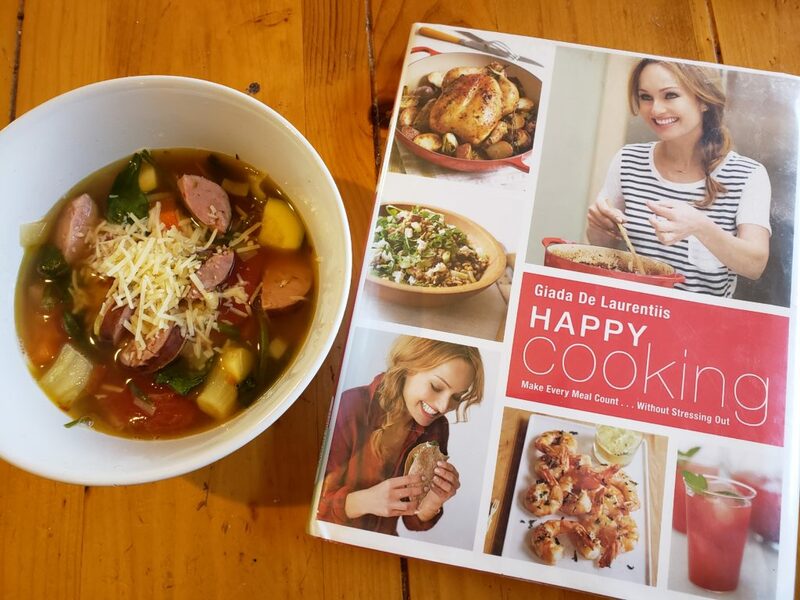 Giada’s House Soup from Happy Cooking. I love making soup on Sunday and eating it for the week, and as it’s cold down here in Dallas, I thought this soup would fit the bill. This is a straight forward recipe, nothing complicated, but I did make a few changes. I used canned beans instead of cooking the beans in the soup and omitted farro (so I cut the cook time in half.) I thought I had diced tomatoes in the pantry (PANTRY/MEMORY FAIL) so I used whole and broke them up. (Note-it would be better with diced so make sure you have them.) I forgot a lemon (are we seeing a pattern here?) so I omitted that. I decided to add some more veggies-one zucchini. I subbed spinach for kale. I think diced butternut squash would be great in this soup, as would mushrooms. This is a keeper! With leeks, fennel, carrots, beans, sausage (I used the healthiest verison I could find), greens, it’s full of veggie goodness. I’m going to the store to get a lemon to squeeze on top of each serving, too.